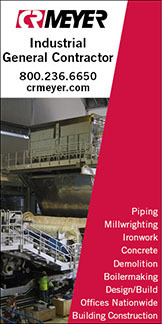 LYONS FERRY, Washington (From news reports) -- Columbia Pulp's mill at Lyons Ferry is expected to be running as early as May, after a five-month delay. Crews are finishing electrical wiring and commissioning equipment at the facility, which should be running at full capacity by the end of this year, said President and CEO John Begley. Bad winter weather was one, but not the only, factor in the postponement. "There was a lot more engineering and complexity than we originally thought," Begley said. The facility will turn wheat straw into pulp in what the operation's backers describe as the first nonwood pulp mill in North America. 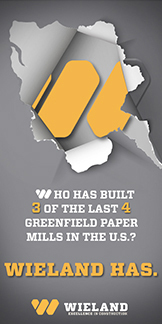 The pulp will be used for products paper towels, plates, cups and fast-food packaging. The 140,000-square-foot facility at Lyons Ferry, near Starbuck, is the centerpiece of the $200 million project. It will be powered with gas-generated electricity and consume 350,000 gallons of water a day from three on-site wells. By comparison, a standard family uses about 10,000 gallons of water a month. The plant is part of Columbia Ventures, a business that has investments in a variety of businesses, such as Walla Walla-based PocketiNet Communications that offers high-speed internet, and a company that makes augmented-reality devices for industry. As construction continues at Lyons Ferry, the company has been filling positions, seeking applicants with mechanical aptitude and problem-solving skills. Staff members are being brought on at a rate of two a week so they can be trained individually. A total of 40 people work for Columbia Pulp at Lyons Ferry. An additional 25 employees are at a site in Pomeroy that makes samples, and 20 more are staffing offices in Dayton. Another 40 people will be hired for Lyon's Ferry, and some of those in Pomeroy and Dayton will be moved to Lyons Ferry. "It's not been that difficult (to find qualified employees)," Begley said. "We've had a lot of interest." Housing, however, has been a challenge. Some employees already lived in the area, while others commute from places such as Lewiston and the Tri-Cities. Some are relocating, and not all of them have brought their families yet. "We have a lot of employees living in mobile homes," Begley said. 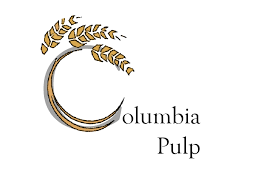 Columbia Pulp is also seeking buyers for the finished product and monitoring the amount of straw being collected by its supplier, Columbia Straw. One selling point is that straw pulp is a good substitute for hardwood pulp that is in short supply in the Pacific Northwest. "We've gotten a lot of interest from companies that are looking to send a sustainability message," he said. At full production, Columbia Pulp will need 250,000 tons of wheat straw annually, a small fraction of the 4 million tons left on the ground each year after harvest within a 100-mile radius of the facility. Right now 120,000 tons is being stored outdoors at five Columbia Straw Supply sites. The oldest was collected in 2016 and will be turned into compost, since it has deteriorated. "It's not ideal," Begley said. "We would have liked to start up earlier."